Hi Lee. Can't believe you came up on the blog roll, how lovely to see you around, what a time you have been away, but as long as you are ok, that's fine. Good luck with the wedding bits, you will have your future sister-in-law sorted in no time. Love your tutorial, a great process and outcome, well videoed too. Can't wait to watch this tutorial when I get back on my computer . Looks quite fascinating . Hugs Mrx a.
Hi Lee, I was actually thinking about you and how you have been MIA lately. I'm happy to hear you are ok. Love your new project. I do have a couple of questions about your tutorial. 1st, what was that stuff you added to the umber color paint? 2nd, what is the name of the metallic rub-ons you used? 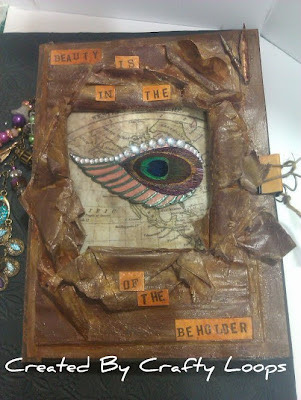 Last, how exactly did you achieve the ripped open look to the journal cover?? It looked like there is some layering, but there is way more to it. Just beautiful. You are a genius!! I love the look of this cover. AMAZING!!!!! Well worth waiting for. Glad to hear you are alive and well. We missed ya!! Hi Lee good to see you back around, we are all guilty of popping in and out of blogland lately the real world has a habit of getting in the way!! Fabulous creative work again Hunny you really are a star!! I made my nephews wedding invites last year - it was great fun but a relief when I had made all 150 of them!! I looked down my blog list the other day as it occurred to me I'd not seen you lately, could see it was a few weeks ago when you last posted so set about sending an e-mail. Needless to say I never quite got round to it and then I see today you posted a few days ago and I missed it. At least I'm am pleased to see you are OK and back at the tutorials. I was worried you are still suffering from the after effects of the flu. Getting back to normal, well sort of, so missing my beloved Buffy and my craft room seems empty. And as a result Mr Mojo is gone walkabouts. Lee, this is probably the best craft video I have seen. Wonderful! I LOVE your sense of humour, you had me in stitches, and I LOVE the faux leather texture too. Must hunt down some decent Rubens to have a go at this, I reckon it would make an awesome cover for a book card. Well done that woman! So glad I am finally able to see our vids - have my own iPad and data allowance now, mwahahahaha. I love this! I am working on Halloween fun and this will make a great Spells book cover. I have to try your technique.